Step 1 In a large stock pot, combine the beans with the chorizo, bacon, pork riblets and lamb's tail. Add enough water to cover by 2 inches, and bring to a simmer over high heat. Reduce the heat to maintain a gentle simmer and cook, stirring occasionally, until the beans are tender, 11/2 to 21/2 hours (timing will vary depending on the age and condition of the beans). Check the water level occasionally, adding water if it is absorbed too quickly. Step 2 When the beans are almost ready, in a large sauté pan, heat the olive oil over medium-high heat. Add the onion, leek and green and red pepper, and sauté until tender and lightly colored, stirring frequently, 10 to 15 minutes. Remove from heat. Step 3 Stir the sautéed onion mixture in with the beans, along with the paprika. Taste and adjust the seasoning with 11/2 teaspoons salt, or as desired. This makes about 2 quarts of beans. In Recipes-list.com we have selected the most viewed recipes from category - Main courses . Enjoy the best recipes specially selected for you! 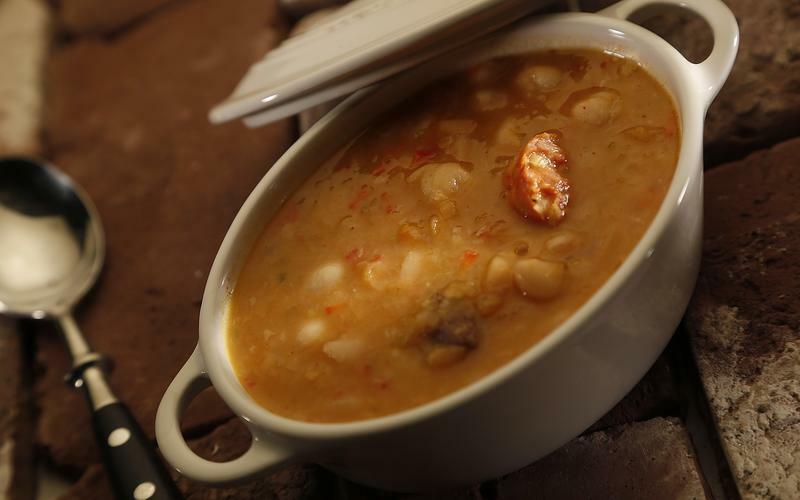 Pochas (White beans with chorizo and pork riblets) is the right choice that will satisfy all your claims.